Correct reproduction of the original 350 front fender emblem which was originally installed on all 1970-75 Camaros with a 350 small block without the Z/28 option. Features the correct chrome lettering on black background. Sold individually. Reproduction of the script "Camaro" front fender emblem. Licensed by GM as Official GM Restoration Parts. Sold individually. Two required per vehicle. Reproduction of the Rally Sport fender emblem. Includes speed nuts. 1970-74 Z28 Fender Emblem with Self Adhesive Backing. 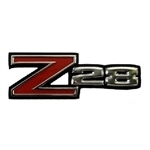 Reproduction of the Z28 fender emblem. Includes speed nuts. Reproduction of the "camaro" front fender emblem. For non Z28 models. Sold individually. Two required per vehicle.